Preheat oven to 400° F. Chop garlic into a mushy paste. Sprinkle generously with salt. Combine garlic, butter, potatoes, half-and-half, and mustard in a cast iron skillet, mix well. Season with salt and pepper and a hint of nutmeg. Bring mixture to a boil over medium-high heat while stirring with a wooden spoon. Cook 8 to 10 minutes, until the potatoes are a little tender, and their starch has thickened the liquid considerably. Smooth the top as much as possible. (At this point you can store the dish until you’re ready to bake, even overnight in the refrigerator.) 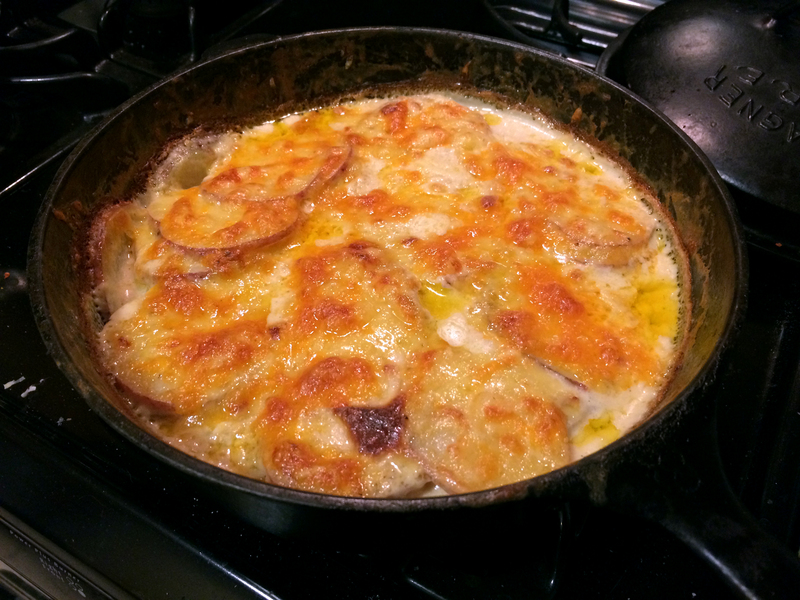 Cover the gratin with Gruyère and bake until deeply golden brown, about 20 to 30 minutes (longer if chilled overnight). Let the gratin cool and set a little before serving.